Patagonia is a ruggedly beautiful land cut from jagged Andean mountains and blue glaciers. Patagonia has a climate that commands respect from the gauchos that work the land to the pumas, condors and other wildlife that make this spectacular region their home. For trekkers, it is and adventure holiday and trekking paradise; soaring spires and vast glaciers coupled with awesome panoramas. With so much space and variety, a traveller faces a multitude of questions when planning an adventure holiday in Patagonia. Fundamental is the choice between hiking independently or with a group, so here we give advice as to find the best fit for your perfect Patagonia holiday by comparing our Patagonia Highlights and Self-guided Patagonia trek. Our most popular tour, Patagonia Highlights, features three national parks and two great treks in a fortnight. All you need do is take photos, hike and enjoy your holiday to the maximum. The tour is an opportunity to share with other likeminded people of different nationalities, and great for the solo traveller especially with the hostel/tent share option. In Fitzroy, only guided groups can camp within the park, and our Highlights tour stays at fixed camps with dining tents, tables, chairs and wine (not included) served with great meals. Your guide always prepares you for the conditions the next day and even better – no need to carry a sleeping bag or mat as that is provided at the camp. The group’s collective purchasing powers mean being moved around remote areas between Paine and Ushuaia in comfortable, private vehicles. With our expert guides, you can get further into the parks, learn more about the flora and fauna and relax during the day. You need not make any navigational decisions, you wait to be fed marvellously and if any issues arise you have your guide to help. Eating traditional asados (BBQ), meat, salads and fruits are only really possible on extended group trips because of the logisitic support teams. Apart from Patagonia Highlights we have more options in Patagonia to offer. For a Classic W or Paine circuit trek in Paine, choose from spectacular eco-domes to luxury hotels on the outskirts of the park, and you can shower, get drinks (hot and cold) and sleep wonderfully in comfortable beds. There are some other expeditions we offer that simply must be guide-led, like the Ice Cap trek in Argentina, because the terrain is too dangerous to cover independently. 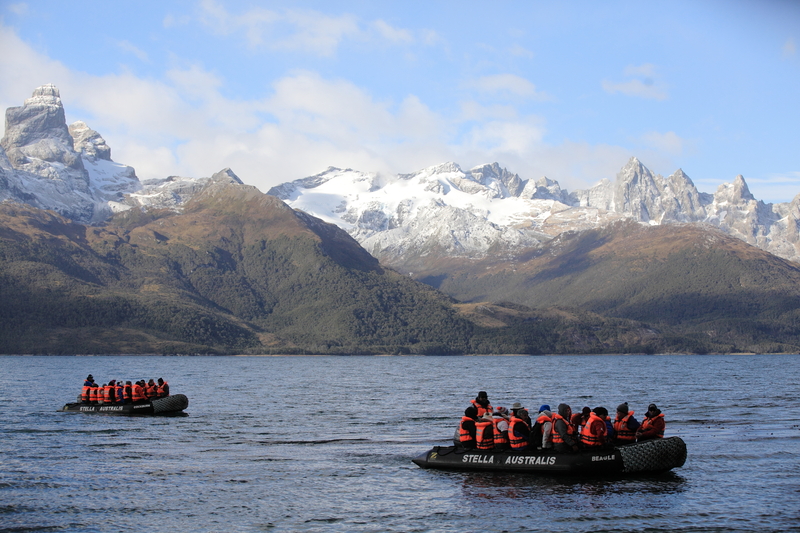 The Patagonia self-guided tour we offer appeals to the independent hiker and the group traveller. It’s cheaper than a group tour, but you don’t have to worry about the logistics or carrying a heavy backpack. Leave your luggage in Natales, and carry only your trekking clothes around Paine. You walk at your pace to a predetermined programme, stopping en route when you want, where you want and for how long you want. The suggested itinerary is an outline and we can change and tailor it to suit you. In Paine there are refugios to stay at. They have a limited number of mixed dorms, with all the bedding provided. It’s best to book these in advance with us as the refugios fill up quickly – if you turn up on the day you will most likely find the refugios completely full. We make sure you have breakfast and dinner sorted at the refugios, plus a packed lunch to keep you going. You need only take some snacks – the refugios have supplies, but they are very expensive. Although you are not with a designated group, you’ll meet lots of other hikers on the same route as you, staying in the refugios and giving that sense of camaraderie. Fitzroy in Argentina is not as open to the independent hiker because only organised (guided) groups can camp within the national park. You still have the chance to do a variety of day hikes in and out of the park though, all of which are stunning. Chalten offers a few small shops where you can buy goods for packed lunches. We book up the buses and hotels to make it easy for you on our self-guided tour (link), as spaces go fast in Chalten. The Self-guided tour is perfect for those that wish to walk under their own steam but know that all the arrangements they would have made are already taken care of. There is little more satisfying to a hiker than planning and executing a full hike under one’s own steam. It’s also the cheapest way to walk, but you need to put more than just leg-work in. If you want full independence, than you can do that easily in Paine (circuit or W trek) and camp at designated campsites along the way. You can’t camp in Fitzroy. You’ll have to camp in Chalten, and do a series of day hikes. If you go independently in Paine, you can buy provisions in the nearby Puerto Natales, everything from dried fruit to gas. The refugios have some limited provisions to buy, but they are very expensive. You’ll have to carry a tent and all your provisions, so expect to lug 20kg around. The advantages are you can sit out bad weather while groups must push-on and the parks are yours when you want them to be. Make sure you buy a guide book, know your route, know how to navigate in bad weather, have appropriate clothing, extra food in case you get stuck somewhere and are physically prepared. The services provided by Andean Trails from El Calafate were outstanding-super professional, helpful and included touches that made a world of difference (printing out boarding passes for us and changing our bus reservation upon arrival to El Calafate to get us in to El Chalten earlier).